The DC Storm LPG ... fitted with Hepa 13 filters. Dustcontrol UK has launched a range of highly effective construction equipment, including its new DC Storm LPG propane-powered vacuum. This equipment is being showcased alongside its powerful Tromb 400 extractors, DC 2900 and DC 1800 eco vacuums, and DC Aircube cleaners at the Executive Hire Show 2019 this month (February 6-7) at the Ricoh Arena, Coventry, UK. 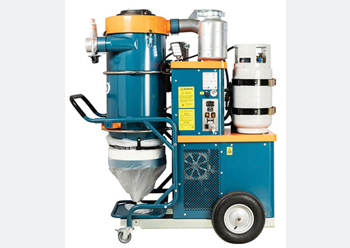 According to James Miller, managing director of Dustcontrol UK, the DC Storm LPG has a 15-kW motor with the capacity to manage dust extraction in conjunction with work involving large floor grinders, hammer drills, scarifier/shaver or cutting machines for surface preparation, as well as heavy-duty cleaning with long hoses. As with all of Dustcontrol’s mobile equipment, the Storm LPG is fitted with Hepa 13 filters and built to Application Class H as standard for a no-compromise approach. Dustcontrol UK, based in Milton Keynes, has over 45 years of experience in developing dust extraction solutions and centrallised vacuum systems to fit client requirements in the construction industry. It is an expert in capturing dust at its source – both where and when it’s created.